Bio 25 advanced tank cleaning machine was specially developed for food and dairy, pharmaceutical, chemical processing, transportation, beverage where self-washing, low fluid consumption and hygienic design is required. The Scanjet Bio 25 rotating jet-head from AaquaTools is a hygienic tank cleaning machine that provides 360° coverage within a given tank or process vessel that is superior to that of any other rotating jet-head in its class. 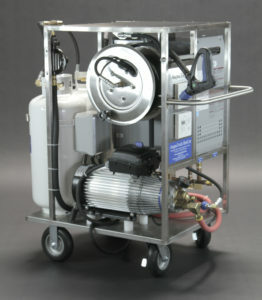 The Bio 25 is self-powered by the flow of the fluid through the inlet cone of the machine. 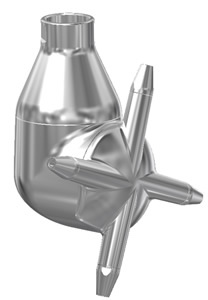 An increase in pressure and flow will correspondingly increase the length of the jet and impact upon the tank or vessel surfaces. The Bio 25 employs exclusive self-washing features that allows itself to be completely covered and has been certified in rinse validation protocols such a riboflavin rinse validation and yogurt washing trials.